When TJ Alas began his collegiate career at Eastern Kentucky University, he never believed he would be able to play with his younger brother Brendan. After three seasons at EKU and a junior season where he hit .378 and had a .678 slugging percentage, Alas sat out what would have been his senior season with an injury. With no eligibility left at EKU, TJ began talking with Brendan, who committed to Northern Kentucky in Dec. of 2015, about playing together. 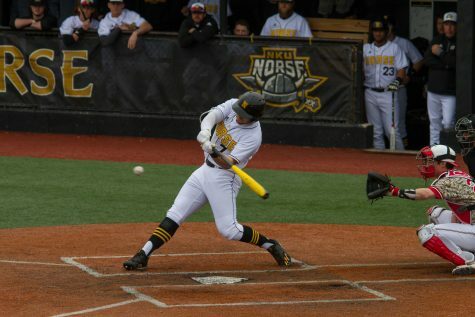 With an opening in right field for the 2017 season, TJ saw NKU as a perfect fit. “I talked to him last year about putting it together and coach (Todd) Asalon was all aboard,” TJ said. TJ made the most of his senior year at NKU, currently hitting .311 with 11 home runs and has reached base in 34 consecutive games. In his freshman year, Brendan played in six games and made two starts, but has hit .273 with a home run. For now, Brendan is trying to learn as much as possible from TJ so he will be prepared to take a starting role next season. Along with his approach at the plate, TJ has tried to help Brendan adjust to the speed of the game. Baseball has been a way of life for the Alas’ since they were young. Their father, Tom, played college baseball and basketball at Manhattan College while their uncle played college baseball at Villanova. Tom fostered a love for the game in his sons while coaching their teams as they grew up. “If we weren’t playing baseball, we were watching baseball. We are a huge sports family overall so sports has just been everything for us,” Brendan said. While traveling the country coaching hundreds of baseball games, Tom taught his sons the importance of hard work and dedication to the game. “What he instilled in us was just that it doesn’t matter how good you are; you can control how much you work. He’s always been that motivator for us,” TJ said. Outside of the Bill Aker Baseball Complex, TJ and Brendan are almost inseparable. “Some would say we are best friends,” Brendan said. The two can often be seen getting a bite to eat after practice and then hanging out for hours afterward. While the two brothers occasionally bicker, the conversation usually remain playful. One of their favorite things to do is debate about things happening in the sports world. They often find themselves discussing who the better NBA player is: Lebron James, who TJ thinks is overrated but is Brendan’s favorite athlete, or Michael Jordan. “We will each take a side and just roll with it,” TJ said.